The Kalorik Induction Cooking Plate features a crystal glass surface that delivers evenly distributed heat when cooking with induction-compatible (magnetic) pots and pans. The lack of plastic frame enables use with all cookware and limits damage on oversized loads while the adjustable power settings let you control the cooking experience (and produce the exact amount of energy needed). Whether it's simmering a sauce on low or boiling water this cooking plate saves time and energy, all while remaining cool to the touch and safe for your family. Glass Induction Cooking Plate with LED Display in Blue The Kalorik Induction Cooking Plate features a crystal glass surface that delivers evenly distributed heat when cooking with induction-compatible (magnetic) pots and pans. The lack of plastic frame enables use with all cookware and limits damage on oversized loads while the adjustable power settings let you control the cooking experience (and produce the exact amount of energy needed). Whether it's simmering a sauce on low or boiling water this cooking plate saves time and energy, all while remaining cool to the touch and safe for your family. 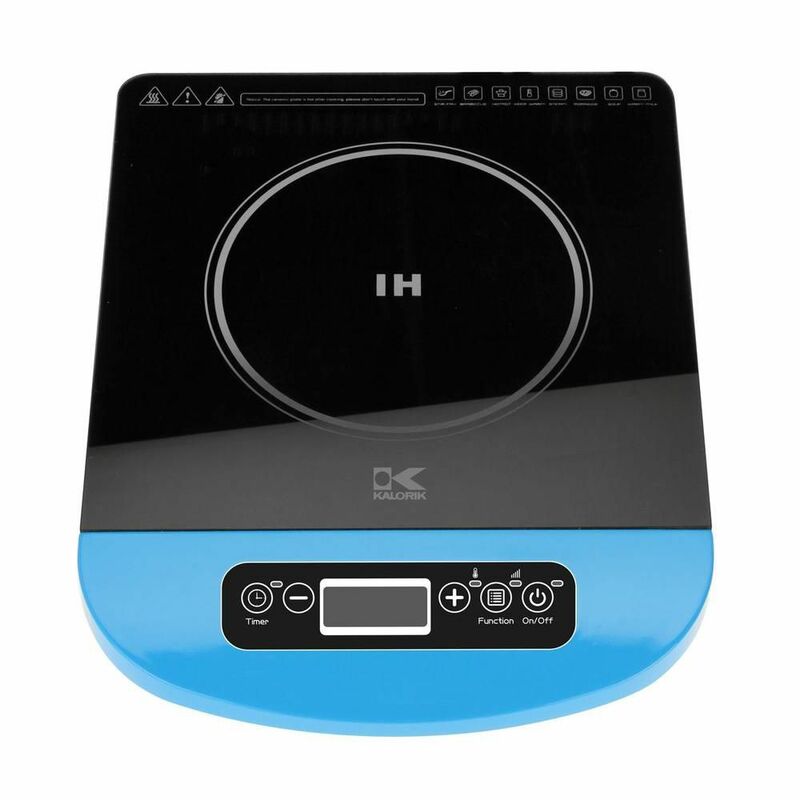 Glass Induction Cooking Plate with LED Display in Blue is rated 4.0 out of 5 by 1. Rated 4 out of 5 by Chase58 from Impressive heat Works great! I was very impressed with how quickly it will boil water. You have to have the correct pan (steel works the best) but very impressed. Does this cooktop have timer to automatically shut off? Dear Customer, This product is not made to be used in outdoors.